No I am not in the hospital having a scope of my innards. Molecular gastronomy is actually a modern style of cooking that is gaining followers and critics at a rapid pace. I just recently discovered it myself while staying at a timeshare rental in Las Vegas, and I am still not sure what to make of it all. As a bit of background, molecular gastronomy is really the science of cooking, rather than an actual cuisine. It attempts to observe and explain the chemical transformations in food when cooked, and then use this knowledge to make dishes with more intense, even unfamiliar flavors and textures. So rather than seeing the typical grill, range-top and ovens you associate with a restaurant kitchen, you might encounter a thermal immersion circulator, centrifuge, and syringes. And on your plate, don't be surprised to find foams, gels, and powders where you would normally see cuts of meat, sauces, and sides. And then there is the liquid nitrogen, lecithin, hydrocolloids, and transglutaminase - a.k.a. 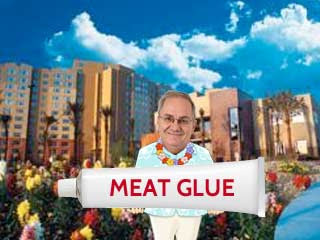 "meat glue". Sounds yummy, huh? Even the name itself - molecular gastronomy - is off-putting, really. In fact many of the chefs who are associated with these techniques, reject this term entirely. Unfortunately, none of them can agree on what to call it, and MG continues to stick around. Whatever you call it, some of the chefs normally associated with this movement are Herve This (the father of MG), Grant Achatz, Ferran Adrià, José Andrés, Thomas Keller, and more. Many of these chefs have multiple locations around the country, and there is a good chance that a popular travel destination is going to have both timeshares and MG restaurants. Las Vegas, D.C., and New York in particular. Beyond the unappetizing name and weird ingredients, the dining experience itself is quite different as well. Take the restaurant é by José Andrés in Las Vegas. Andrés is a Spaniard who trained under MG master Ferran Adria at his restaurant El Bulli, before branching out on his own. Andrés is credited with bringing the "small plate" or tapas concept of his native Spain to MG cooking. So it is not unusual to have 25 - 30 small dishes in one evening, rather than the usual soup, salad, entree, and dessert. That's right, I said 30 dishes. Now when José says, "small plate", he means it. In fact, some dishes don't even come on a plate. One dish - a flower made from yogurt and raspberries - was served on a white ceramic hand, cast from Andrés's own right hand. Another - Bocata de Piquillo (a type of pepper) - was served atop a shoe. I'm not making this up. If this all sounds too weird, get this: é itself is a "hidden restaurant" inside another Andrés eatery called Jaleo at the Cosmopolitan Casino. Jaleo has seatings (with reservations way in advance) like a typical restaurant. é only sits six people at a time, and dinner can take up to three hours. Are you kidding me?! I have certainly focused on the bizarre and unusual aspects of this cuisine - so as to properly prepare you for it - should you choose to explore it. Imagine if you didn't know that head cheese wasn't really cheese, or that Rocky Mountain oysters weren't oysters at all. You did know those two things, right? Anyway, what I haven't talked about at all is the taste, and that would be a mistake. While I could have lived the rest of my life without ever eating off of a ceramic hand or somebody's shoe, some of the flavors I experienced during my experience were like none I have ever had before, nor expect to again. Certain foods when jelled or foamed seem to melt in your mouth. Whereas making a tiny caviar-like ball with others - called spherification - makes for a delayed burst of flavor. And don't get me wrong, it's not all foams, gels and powders. There were plenty of meats, breads, seafood, veggies and more; just in new and unusual combinations and preparations. And any flavor you can imagine: from sweet to sour, smokey to salty, and everything in between, is on full display, and somehow more intense then you have ever experienced them. It's certainly not for everyone, and depending on the restaurant, can be tough on the pocketbook. But if you find yourself in Vegas - and want a really different dining experience - try one of the MG restaurants you can find there. New ones seem to be popping up all the time. Speaking of Vegas, I am staying at Grandview at Las Vegas, and cannot say enough about my stay. It's a 12-story resort on the south end of The Strip. My unit is a one-bedroom with a king bed, queen sleeper sofa, living area, fully equipped kitchen, washer/dryer, large-screen TV and DVD player and a jacuzzi tub. RedWeek members rate it 4.5 stars, and I can see why. Well, I am off to the store to pick up some cold cuts and a Cuisinart. Before I was exposed to the world of molecular gastronomy, I just assumed that cultural stigmas would prevent my dream food from becoming a reality. But now, the baloney smoothie is as good as in my mouth.